From his infancy, music flowed through Axton’s veins. Born in Duncan, Oklahoma, on 25 March 1938, his mother was Texan-born Mae Boren Axton, a pioneering female singer-songwriter who (with steel guitarist Tommy Durden) co-wrote the classic rock’n’roll standard ‘Heartbreak Hotel’, Elvis Presley’s first major hit. Mae played a significant role in furthering Presley’s career as she introduced the then 19-year-old nascent star to his future manager, Colonel Tom Parker, after a show in Jacksonville, Florida, and then (while working for country music promoter Bob Neal) helped encourage RCA Victor’s Nashville division into offering Presley a deal. The country music cognoscenti later dubbed her “The Queen Of Nashville”, and she went on to work with legends of the genre including Mel Tillis, Tanya Tucker and Willie Nelson. Hoyt Axton spent most of his pre-teen years in Comanche, Oklahoma, but, as his father was a naval officer stationed in Jacksonville, the family joined him in Florida in 1949. The young Hoyt graduated from Jacksonville’s Robert E Lee High School in 1956 and later briefly attended Oklahoma State University before following his father into the US Navy, where he served aboard the USS Ranger prior to pursuing his musical career. After his discharge from the navy, Axton pitched up in California and was swept up in the burgeoning early 60s folk scene. He began performing his self-penned songs in San Francisco’s coffee houses and came to the attention of the Horizon imprint, who released his initial solo LPs. Axton’s 1962 debut, The Balladeer, was recorded live in front of an attentive audience at LA’s The Troubadour. While it was primarily a dip into the trad.arr songbook popular with the folkies of the day (it includes staples such as ‘Vandy’, ‘John Henry’ and ‘Brisbane Ladies’), it’s still a fine showcase for Axton’s dextrous guitar picking and earthy, bass-baritone vocal. Shorn of the live audience and Axton’s introductions, The Balladeer was reissued by Vee Jay as Greenback Dollar in 1963, after popular US folk revivalists The Kingston Trio had a chart hit with Axton’s self-penned tune of the same name. The Vee Jay edition also included Axton’s own brooding reading of the song: a compelling story of a ramblin,’ gamblin’ man that still holds its own half a century on. Axton proceeded to release a series of commercially under-appreciated LPs as the 60s drew on. Horizon issued two further folk-flavoured LPs, Thunder’n’Lightnin’ and Saturday’s Child, during 1963, before Axton hitched up with Vee Jay for 1964’s full band, garage-pop collection Hoyt Axton Explodes! and then switched to Exodus to record the self-explanatory Hoyt Axton Sings Bessie Smith: a self-styled proto-covers album featuring gutsy versions of blues staples such as ‘Send Me To The ’Lectric Chair’ and ‘Nobody Loves You When You’re Down And Out’. By the mid-60s, Axton had successfully diversified into film and television. He first appeared in producer David L Wolper’s ABC production of The Story Of A Folksinger (1963) and frequently featured on musical variety show Hootenanny, hosted by Jack Linkletter. He appeared in a 1965 episode of long-running western series Bonanza (‘Dead & Gone’) and later switched successfully to the big screen, scoring parts in movies such as George Sherman’s 1966 western Smoky, 1979’s The Black Stallion, Heart Like A Wheel (1983) and even the comedy horror film Gremlins. Though Axton’s solo career never quite took flight during the 60s, his songs were frequently steered into the charts by other artists. Canadian hard rockers Steppenwolf covered Axton’s ‘The Pusher’ on their 1968 debut, which went to No.6 on the US Billboard 200 on the back of their No.2 hit ‘Born To Be Wild’; ‘The Pusher’ achieved further exposure when it featured in the soundtrack to the counterculture road movie Easy Rider (1969), starring Peter Fonda and Dennis Hopper. Following Steppenwolf’s success, Axton signed to Columbia and returned to the fray with 1969’s My Griffin Is Gone. An atmospheric psychedelic-tinged roots-rock album, it failed to chart but was – and remains – something of a lost classic, featuring the upbeat ‘Sunrise’; the glorious ballad ‘Kingswood Manor’ and the poetic, Gene Clark-esque titular song. Switching to Capitol, Axton released two excellent LPs during 1971, the folk/roots-flavoured Country Anthem and Joy To The World. Mystifyingly, neither charted, even though the latter included Axton’s own version of his song ‘The Pusher’ (a harrowing anti-drug song with an intensity reminiscent of John Lennon’s ‘Cold Turkey’) and the rousing, gospel-inflected titular song. The latter had “hit single” written through it like a stick of rock, and when popular LA-based outfit Three Dog Night released their singalong cover of the track in February 1971, it topped the US singles chart for six weeks straight. Three Dog Night again hit paydirt when their second Axton cover, ‘Never Been To Spain’, rose to No.5 on the US Singles chart, also in 1971. Axton finally scored a little tangible commercial success for himself during the 70s, however, when he recorded a run of LPs for both A&M and MCA (both now part of the Universal Music Group). Axton opened his account with 1973’s unlikely (and underrated) folk/prog odyssey Less Than The Song, but followed it up with arguably his most successful release, 1974’s assured Life Machine, which reached No.21 on the US Billboard Country chart and included hits ‘Bony Fingers’ and the affecting ‘When The Morning Comes’. The latter – which also featured vocal harmonies from Linda Ronstadt – also topped the Canadian country music singles chart and climbed to No.54 on the mainstream US Billboard singles rundown. Axton was a regular feature in the US Billboard country charts until the turn of the 80s. His A&M albums, Southbound (1975) and the following year’s Fearless, both appeared in the Top 30s – a feat equalled by Fearless’ first 45, ‘Flash Of Fire’, which, respectively, went to No.18 on the US and No.9 on the Canadian charts. Outside of Joy To The World, the spirited Southbound was arguably Axton’s most memorable record from the 70s, featuring rowdy, good-time numbers such as ‘Whiskey’, ‘No No Song’ (also a 1975 hit for Ringo Starr) and another countercultural anthem, ‘Roll Your Own’. 1977’s MCA-sponsored Snowblind Friend, however, again ran it close, with the Elvis tribute ‘Funeral Of The King’, an emotive cover of Townes Van Zandt’s epic ‘Pancho & Lefty’ and the cautionary title track among the record’s numerous highlights. With 1979’s Rusty Old Halo, Axton said goodbye to the decade in style. His final LP to clamber into the US Billboard Country and Canadian Country Top 30s respectively, it featured three of his most enduring hits courtesy of ‘Della & The Dealer’, ‘The Hotel Ritz’ and the raw, harmonica-assisted boogie of the titular song. Due to extensive airplay on BBC Radio 2 DJ Terry Wogan’s breakfast show, both ‘Della & The Dealer’ and ‘The Hotel Ritz’ even sneaked into the lower reaches of the UK Top 50, while Axton later performed the evergreen ‘Della’ in Philadelphia as part of the global Live Aid event, in the summer of 1985. Though he recorded a couple more solid studio sets, Where Did The Money Go? and Pistol Packin’ Mama, for his own Tennessee-based Jeremiah imprint, Axton concentrated primarily on film and television from the mid-80s. He frequently appeared in front of the camera during this decade, racking up appearances in everything from short-lived sitcom The Rousters to the Dukes Of Hazzard-affiliated TV movie Christmas Comes To Willow Creek, and also recorded the jingle ‘Head For The Mountains’ for the popular 80s Busch beer commercials. Axton laid down one final – oft-overlooked – solo LP, 1990’s Spin Of The Wheel, which includes several gems, among them the wistful ‘We Could’ve Been Sweethearts’, which was comparable to the best of his 70s heyday. However, his health failed as the 90s drew on, and while he hosted The Nashville Network’s biographical country music series The Life And Times during his latter days, he suffered a debilitating stroke in 1995 and eventually died of natural causes as his home in Victor, Montana, on 26 October 1999. Alongside his late mother, however, Hoyt Axton was posthumously inducted into the Oklahoma Music Hall Of Fame in November 2007, and, as well-received retrospective collections such as the 4CD set The A&M Years and 2004’s Flashes Of Fire: Hoyt’s Very Best 1962-1990 make abundantly clear, his fiery roots-rock catalogue continues to defy the ravages of time. 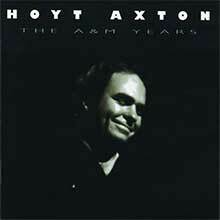 The A&M Years is a U.K. import that collects Hoyt Axton's four albums for the label -- Less Than the Song, Life Machine, Southbound, and Fearless -- on two CDs. This period of Axton's career (1973-1976) is often considered his peak as a recording artist, and some of his best-known performances are here, including "Boney Fingers," "When the Morning Comes," "Flash of Fire," and "Geronimo's Cadillac." This package marks the only appearance of his classic A&M material on CD; for some, that may justify its high import price (which, in reality, is no more expensive than these four albums would cost if they'd been reissued domestically on individual CDs). 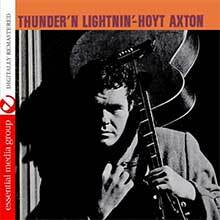 First released in 1963, Thunder & Lightning was Hoyt Axton's third studio album and includes some great tracks including Blue Prelude, Gypsy Woman and I Never Knew My Father. 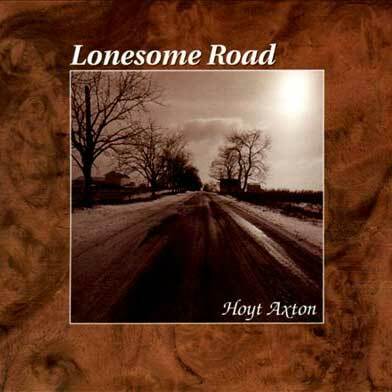 Originally released as an LP, Lonesome Road is a brief collection of ten songs drawn from two 1964 Hoyt Axton albums, Sings Bessie Smith and Explodes. In the '60s Axton's music veered toward folk and rock 'n' roll rather than country, with limited success. "Young Man" and "Big Red" are straight-ahead rockers, and the Bessie Smith material is performed with horns and clarinet in an approximation of the originals, although Axton's vocals are often delivered in an unappealing growl. Given the scarcity of Axton's '60s recordings on CD, serious fans may find something to enjoy here.